Morocco, the host of COP22 happening this week and next in Marrakech, is an example of a country that is working closely with the World Bank and other organizations to shift its economy onto a low carbon development path. It just submitted its official climate plan, or nationally determined contribution, NDC, where it pledges a 42% reduction below business-as-usual emissions by 2030. This is 10 percentage points more ambitious than it previously laid out, ahead of Paris, and we see the plan affecting a growing number of sectors in the economy. Morocco plans a $13 billion expansion of wind, solar and hydroelectric power generation capacity and associated infrastructure that should see the country get 42% of its electricity from renewable sources by 2020, ramping up to 52% by 2030. Carbon pricing is increasingly being used by governments and companies around the world as a key strategy to drive climate action while maintaining competitiveness, creating jobs and encouraging innovation. The importance of carbon pricing was amplified in the run up to the global climate change agreement in Paris last December. As countries move towards the implementation of the Agreement, it is the focus of a World Bank conference in Zurich this week which brings together over 30 developed and developing countries to discuss opportunities and challenges related to the role of carbon pricing in meeting their mitigation ambitions. It has been nearly three months since 195 nations reached a historic agreement at COP21 in Paris to combat climate change and set the world on a path to a low carbon and more resilient future. And in a little over a month, heads of state and governments will gather in New York to sign the Paris Agreement. Countries will then have one year to ratify the agreement, which will enter into force after it is ratified by at least 55 countries, representing at least 55 percent of global greenhouse gas emissions. As we approach the signing of the agreement, it's time for countries and companies to seize the momentum from Paris and move from celebration of a landmark deal to action. 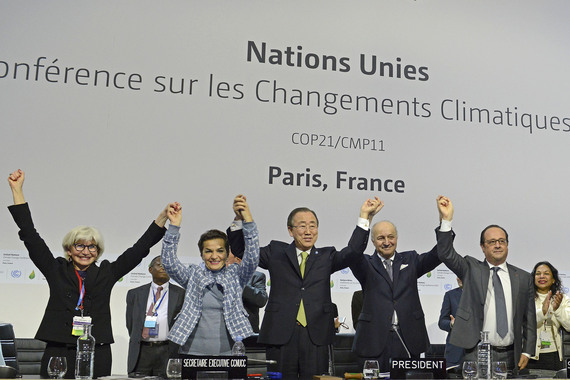 We have an agreement in Paris: So, what’s next for the private sector? It's been two months now since the historic climate change conference, COP21, wrapped up in Paris, concluding with 195 countries pledging to take actions to keep global warming to under 2 degrees Celsius. This is an unprecedented achievement in the long history of international climate policy. Compared to past negotiations, there was a different atmosphere in Paris. The negotiators were determined to find common ground rather than draw insurmountable lines in the sand. Investors lined up with billions of dollars in new financial commitments in addition to the suggested roadmap for developed nations to contribute to the needed $100 billion annually for mitigation and adaptation efforts. And the private sector was more active and visible than ever before: CEOs from industries as far ranging as cement, transportation, energy, and consumer goods manufacturers announced their own climate commitments in Paris to decrease their carbon footprints, adopt renewable energy, and improve natural resource management. This enthusiasm was especially apparent during the CEO panel that IFC, the organization I represent, convened during the Caring for Climate Business Forum by UN Global Compact. CEOs from client companies in India, Turkey, Thailand, and South Africa discussed their innovative climate change initiatives, investments, and technologies, and the challenges of scaling up their climate business. According to the International Energy Agency (IEA), full implementation of countries’ submitted pledges for low-carbon development will require USD 13.5 trillion in investments in energy efficiency and low-carbon technologies from 2015 to 2030. That’s almost USD 1 trillion every year. This means all hands need to be on the deck if the global community is to address one of the biggest development challenges of our times. tools to build integrated plans for the energy sector at small and large-scale. World Bank Low Carbon Development Portal –This comprehensive website provides direct access to a wide range of low-carbon development studies at the community, city, region, national, and global levels, including low-carbon studies (both documents and models) in Brazil and Mexico, rural communities in Nicaragua, as well as Nigeria and Kenya. HOMER Energy (Hybrid Renewable Energy Optimization Tool) - The HOMER energy modeling software is a powerful tool for designing and analyzing hybrid power systems, which contain a mix of conventional generators, cogeneration, wind turbines, solar photovoltaics, hydropower, batteries, fuel cells, hydropower, biomass and other inputs. It is used by tens of thousands of people worldwide. For grid-tied or off-grid environments, HOMER helps determine how variable resources such as wind and solar can be integrated optimally into hybrid systems.